ASUS Zenfone 3 Max was recently launched with two variants. The latest variant was launched in November 2016 having a 5.5-inch screen. The other device that we are comparing is OPPO F1s which was launched in Aug 2016. Both the phones are almost in the same price range. One has a huge battery life and the other has a great camera. 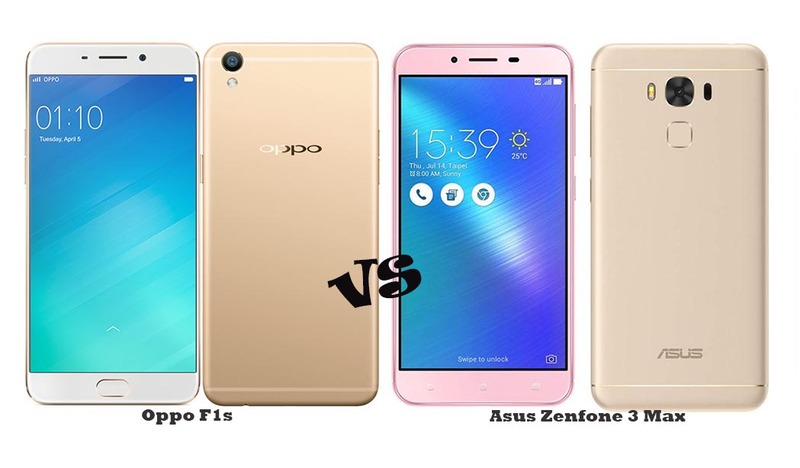 So let us check out ASUS Zenfone 3 Max ZC553KL vs OPPO F1s battle to see who wins and which device should you go for. We will make this comparison based on different factors like design, display, performance, camera, battery etc and then push out a final verdict about it. Both the devices have metallic finish body with thin metal antenna bands at the back. The Zenfone 3 Max has fingerprint sensor on the back while OPPO F1s has it on the home button in the front. The speed of the fingerprint sensor on OPPO F1s is a bit faster than Zenfone 3 Max. If we consider all the factors like build quality, design, aesthetics then I feel Zenfone 3 Max wins by a few points. OPPO F1s has a 5.5 inch HD display while the Zenfone 3 Max has a full HD display having the same size. OPPO F1s comes with corning gorilla glass 4 protection while there is no mention of corning gorilla glass for Zenfone 3 Max. It only has an Oleophobic coating which will prevent the screen from smudges. The display quality of Zenfone 3 Max is better while you get better screen protection with OPPO F1s. The Zenfone 3 Max has a Snapdragon 430 octa-core processor clocked at 1.4 GHz. On the other hand, OPPO F1s has a Mediatek MT6750 octa-core processor clocked at 1.5 GHz. Both the devices have 3 GB of RAM. On the graphics end Zenfone 3 Max has an Adreno 505 GPU while OPPO F1s has Mali-T860MP2. Overall the performance on the both the phones is almost same. But if we consider the benchmarks then Zenfone 3 Max leads the performance race. 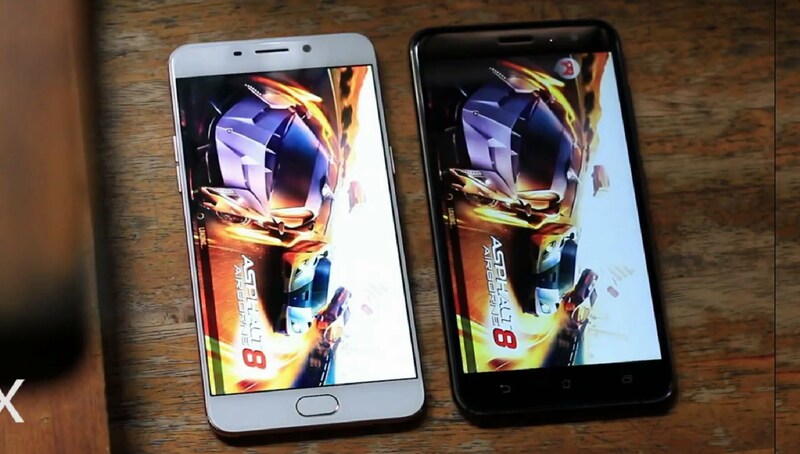 Zenfone 3 Max has Android 6.0 Marshmallow running on it with the ZenUI theme, while the OPPO F1s has Lollipop running with Color OS on top of it. The UI taste will depend on the user but if we compare the Android versions then Zenfone 3 Max leads with the latest version. The OPPO F1s is termed as ‘Selfie Expert’ and has 16 MP front camera with 13 MP rear camera. Zenfone 3 Max comes with 16 MP rear camera with 8 MP front facing camera. The Zenfone 3 max has dual tone dual LED flash while the OPPO F1s comes with single LED flash. The Zenfone 3 max also has laser auto-focus with continuous auto-focusing. Both the phones perform great in outdoor conditions but the real difference is in the noise introduced in indoor lighting or low light. I would say that OPPO F1s has a better camera quality with minimal blur in low light. Plus the front facing camera of OPPO F1s has natural color reproduction while that is not the case with Zenfone 3 max. Both the phones have manual mode to play with more advanced settings like exposure time, ISO etc. Overall I like OPPO F1s better in terms of camera. There is not much difference when we see the connectivity options offered by both the phones. Both devices have Wifi, Bluetooth, GPS, USB OTG, & VoLTE support. The only difference is that OPPO F1s has dual SIM support with dedicated memory card slot while the Zenfone 3 max has hybrid SIM slot. So if you are thinking to expand your existing storage i.e. 32 GB then you need to sacrifice one SIM slot. So I guess OPPO F1s has one advantage when it comes to connectivity options. The Zenfone 3 Max comes with a huge 4100 mAh battery pack while the OPPO F1s has 3075 mAh battery. In terms of battery life, the Zenfone 3 Max will last longer than OPPO F1s. So if you are someone who is a power user with an addiction to 4G usage then I would recommend choosing Zenfone 3 Max. The OPPO F1s(32 GB variant) is priced at Rs. 16,990 while the Zenfone 3 Max is valued for Rs. 17,999. The 64 GB upgraded version of OPPO F1s is available for Rs.18,990 with 4 GB RAM. OPPO F1s comes with earphones in the box while the Zenfone 3 Max comes with USB OTG cable. The winner will be now decided based on your requirement. If you want a phone with good battery life and performance then you can go with Zenfone 3 Max. On the other hand, if you are someone who is obsessed with taking selfies, pictures and wants a dedicated storage option then go for OPPO F1s. Hope you liked the ASUS Zenfone 3 Max ZC553KL vs OPPO F1s comparison. If you have any doubts or suggestion then please drop them in the comment section below.